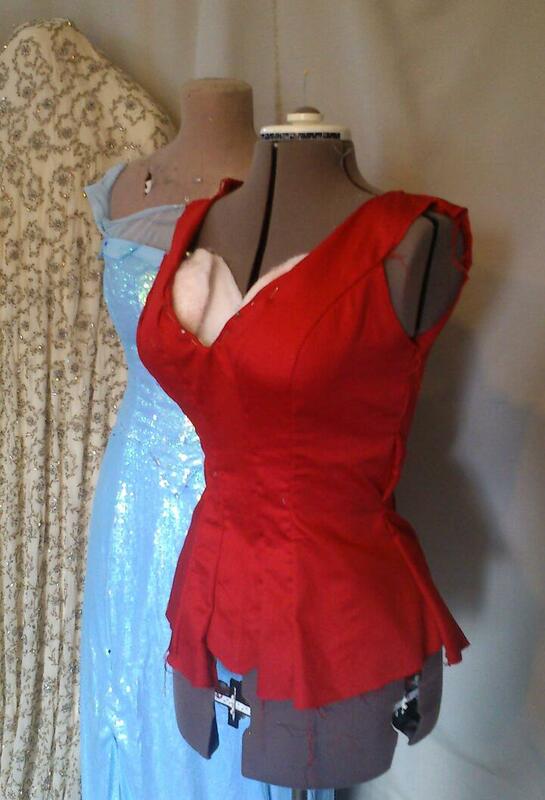 I may have to take a pattern from the last bodice for The Mina and maybe, maybe remove the over bust seam and cut in gores. Fortunately there is a fair bit of the rip stop cotton. Oh yes! Actually cutting gores and gussets will work and probably even better with the cording. Just got a copy of Jill Salen’s Corset book. I need to make it as a separate lining and line the silk in something to just not show the cording. It was always going to have to avoid the boning of course. Okay actually yes I can use my fabric I just need to decide on unpicking or finding all the vertical lines for the vertical cords and horizontal for horizontal. Okay. This is now a plan with potential! Even more so than Elsa- same pattern but I’m avoiding the desire to tone it back. And behind them both is the basis of a rather shapeless elf dress. Mina is two layers of sateen so far and still pinned at key points. I’ll try and pinch a little more under the bust though it does work better on me (plus padding). Slightly general untagged post as I am fighting what I know as physical signs of depression. Right now I’m having some relief from the therapy but have no appetite and just want to sleep. Two issues related to the therapy but I also found myself starting to delete myself from online again and that is not part of the sick reaction. This tends to be a time of year when all sorts of stresses fall, and this year has just been a doozy. Author m d bPosted on 2014-12-21 2017-04-16 Categories projects: media recreations, UncategorizedTags mina, mina absinthe, mina harker, mina murreyLeave a comment on BOOM! THAT’S CURVY!